Millenium Way Walk 31, from Claydon. This gentle 7 mile circular walk starts in the picturesque village of Claydon, and meanders across mostly flat farmland & open countryside, crossing the Oxford Canal at two points and touching the delightful villages of Lower & Upper Boddington. Claydon is Oxfordshire's most northerly village. Some local pubs only offer limited opening hours so check with them first if you wish to take refreshment. 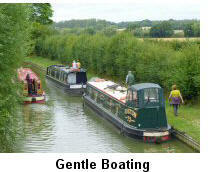 Carpenters Arms, Lower Boddington and The Plough Inn, Upper Boddington (only open evenings Mon - Fri). Why not consider taking a picnic? 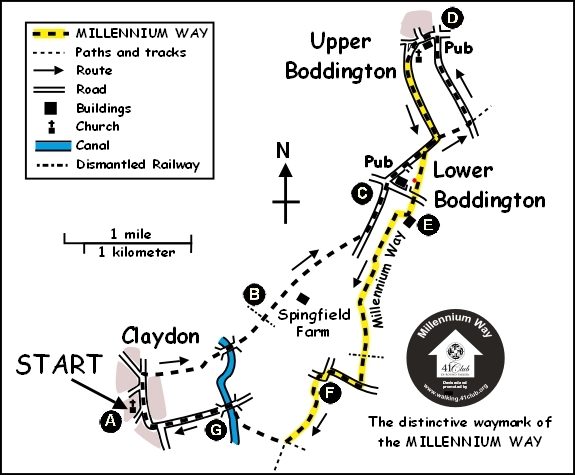 For part of the walk, you will enjoy the delights of The Millennium Way where you will be guided by the distinctive black Millennium Way waymarkers Find out more about the walk by clicking on the information icon. 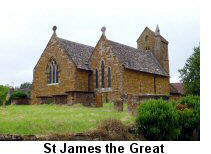 We begin our walk from St James the Great church in the picturesque village of Claydon. With your back to the church (at the East gate) go left down the road, through the village, then take footpath right signed Lower Boddington (opposite the junction with Fenny Compton Road). Walk between fences then take stile to field. Go ahead for a few yards and take care not to miss fence stile right. Take this fence stile into field and go left keeping hedge left to stay along edge of field. Go over double stile and keep ahead along left field edge to take further stile to next field. Keep ahead with hedge left to corner of field then cross canal bridge and ahead through two fields to eventually take footbridge over small stream to next field..
Go ahead over dismantled railway line and take stile into next field to go 1/4 right across field and take double stile and footbridge just to left of farm buildings by a large lone oak tree. 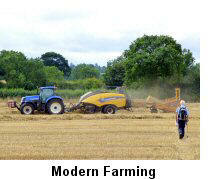 Stay ahead under power lines with hedge and farm buildings right. After approx 200 yards take gate right, crossing the scrub to take further stile into next field. Go left along edge of field to take small plank bridge and double stile (in poor condition) in top left corner. (Take care, the wooden handrail is very insecure). Go diagonally 1/4 right across centre of field (or around right hand perimeter if heavily cropped) towards far right corner, through corner gap and turn left onto lane. Stay along lane to enter Lower Boddington and arrive at cross roads with Carpenters Arms ahead of you. Go ahead over crossroads, and with Carpenter's Arms on your right, walk along Hill Road through Lower Boddington. At the outskirts of the village continue uphill, ignoring the first footpath right, and where the road swings left take bridleway right to Cleveland Farm. Go up track uphill, and at the top opposite the first large barn take metal gate left to field. Go right with hedge right to field end and exit field by gate to road. Go left on tree lined road and after some 1/2 mile come to crossroads. Go left on road towards Upper Boddington. Pass The Plough Inn on left, and after some 70 paces take short road left to find T junction. (At this point you join The Millennium Way and will be guided by the distinctive black Millennium Way waymarker). At this T junction go left o n Church Road to pass post box left and school right and leave Upper Boddington (a slight detour on your left to visit St. John the Baptist Church is worthwhile). 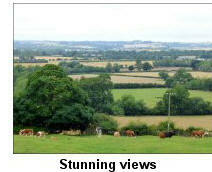 Enjoy panoramic views right, and after some 1/2 mile road swings right as you enter Lower Boddington. Go past the bridleway left which you took on the outward route then opposite first house on right (Sears Farmhouse) take bridleway left, at junction of drives go ahead on lane to road. Cross road and go ahead on cinder track past Cleve House then after a short distance turn right over stile immediately after the entrance to Paradise Farm. Turn 1/2 left to corner of small paddock and take stile. Go with fence right to field corner and take gate left. Cross bridge and go immediately left through next large gate into field. Turn right to continue up field with hedge and fence right to take gap by dilapidated stile. Stay ahead along wide field edge with hedge right eventually to join farm track which bears left with fence. Continue with wire fence right until start of hedge right. Go ahead some 60 paces with hedge right, then go diagonally 1/2 left across field, along an ill defined path (take care here as path is easy to miss) to take way marked mid hedge gap. (You may need to circumvent crops in this field as the farmer does not always make the footpath obvious and indeed the crops may obscure the waymarked gap in the hedge). Go through this gap into coppice to take way marked gap then go 1/4 left directly across field to reach hedge. Go right at hedge to reach far corner of field. Take the corner gap to road then turn right. Continue to road junction then go left (signed Claydon) and where the road turns sharp right go left through wide gap then along bridleway. Go ahead across field to take gap and continue with hedge R. Go through gated gap and cross field past two well separated oak trees to mid hedge gap. (If this field is heavily cropped with an indistinct path just go left around field edge to reach gap on far side). Take gap and cross field towards next mid hedge gap. (Here we leave The Millennium Way). Do NOT take gap but go right along field edge keeping hedge left. Go through corner gaps of next two fields keeping hedge left and keep a sharp look out for a concealed waymarked footbridge on left just before corner of field. Take footbridge into field continuing 1/2 right across to far corner stile and metal gate by canal bridge. Go over stile to road then over canal bridge continuing gently up the road to reach a junction. Turn right at the junction which will bring you back into the peaceful village of Claydon and your starting point near the church. The church, and interesting double-gabled building with lovely stonework dates from 1100 but was heavily restored in 1860, obliterating many of the medieval features, but a squint from chapel to chancel survives. 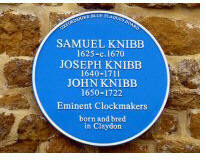 Three members of the famous clockmaking Knibb family were born in the village between 1625 and 1650. A blue plaque on the church commemorates them. The Carpenters Arms is a fine traditional pub, but only has limited opening hours, might be as well to phone ahead if you decide to make this a refreshment stop. Boddington Reservoir, a top match venue for the serious angler, is to the east of the village. 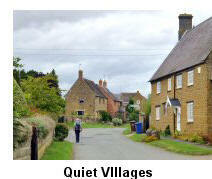 The route of HS2 passes close to the village and is likely to cause serious noise pollution. A number of applications for windfarms have been made for the Boddington area, so the residents may have further issues in future. The village has a considerable number of listed buildings, including the 13th century church of St. John the Baptist (grade I), the former 16th century rectory (grade II) and The Plough, a fine grade II listed stone and thatch public house. Although having only around 700 residents, the village has a garage, and is also home to a successful motor racing team, Team GCR which in 2009 fielded a car in the FIA European GT4 Championship. The Welsh Road, an old drover’s route forms the eastern boundary of the parish. 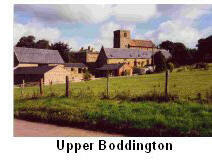 The spelling of Boddington has changed over the centuries from Botendon in Domesday Book (1086) through Bottelendon (12th century Survey of Northamptonshire), and Budinton in the Calendar of Close Rolls (1244) to Botyngdon (1358), Botyndoun (1396) and Botyngdon (1428). In the course of conversation with residents of the two villages, many interesting facts have come to light. For instance, the Manor House in Upper Boddington lost a top storey when a ‘flaming bomber’ crashed into it at the close of the last war.